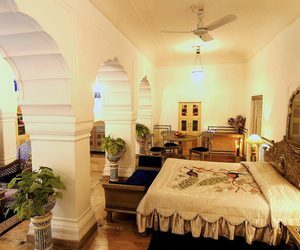 Exquisite Mughal archways, intricate embroidery, gold leaf and ivory abound in the most luxurious suite at the Raj Palace Hotel, built (as a palace) in 1727. The four-storey Shahi Mahal suite is accessed through a private entrance in a private garden and has its own theatre, library, pool and roof terrace with a spa. The opulence is currently being pushed up a notch – the Shahi Mahal is undergoing a renovation and will reopen later this year. Cost per night: A regal US$65,000 (A$85,600).